Atlanta Marks 50 Years Since King's Funeral Services - Integration Through Media ....! (VOA): Hundreds of friends and admirers turned out Monday for a march and church service honoring the Rev. 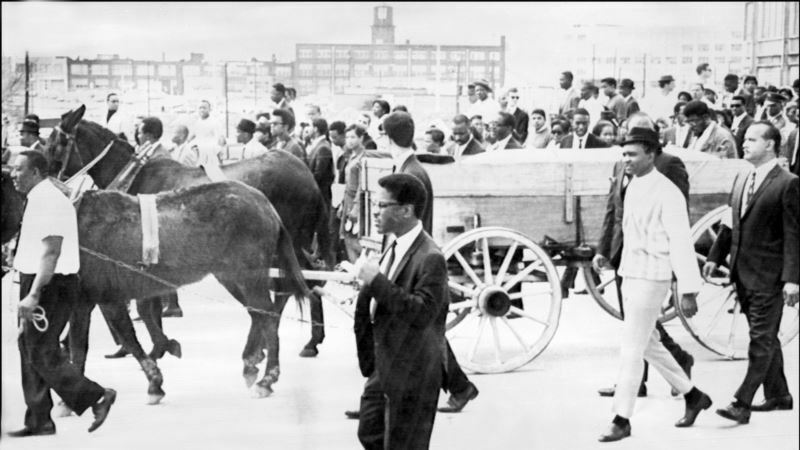 Martin Luther King Jr. on the 50th anniversary of his funeral services in Atlanta, where large crowds gathered in 1968 as a mule-drawn wagon pulled the civil rights leader's casket through the streets. Two of King's children, the Rev. Bernice King and Martin Luther King III, attended a service Monday at Ebenezer Baptist Church, where pews were also filled by the likes of King confidant Andrew Young and comedian Chris Tucker. Afterward, hundreds were expected to join a march to the Georgia state Capitol. Young, former U.S. ambassador to the United Nations and a former Atlanta mayor, said he still has not been able to accept King's death five decades after his assassination April 4, 1968, in Memphis, Tennessee. "He gave his life unlike I was able to," Young said. "I don't know about in your heart, but in my heart Martin Luther King is very much alive. In my mind he's very much alive," Young said. "In spite of all the problems we have, [he] continues to reign among us, calling on us to do better and be the best that we can be." The events Monday in Atlanta followed a host of tributes honoring the slain civil rights leader last week. Cities across the U.S. marked the 50th anniversary of King's death. King was shot on a balcony at the Lorraine Motel while visiting Memphis for a sanitation workers' strike. Small-time criminal James Earl Ray pleaded guilty to the killing and quickly recanted, claiming he was set up. The conviction stood, and Ray died in prison in 1998. Five days after King was shot, two funeral services were held in Atlanta on April 9, 1968. Following a private funeral at Ebenezer, King's casket was loaded into a wagon pulled by two mules for a 40-mile (6.4-kilometer) procession through downtown Atlanta. Thousands lined the streets to view the casket on its trip to Morehouse College, where a public service was held at King's alma mater. At the church service Monday, Mary Gurley took the podium to reprise the mournful hymn she sang during King's funeral five decades earlier. "This is for you, M.L.,'' Mary Gurley said before a solo performance of "My Heavenly Father," which she sang as a young choir member during King's 1968 funeral. "This was our theme song."